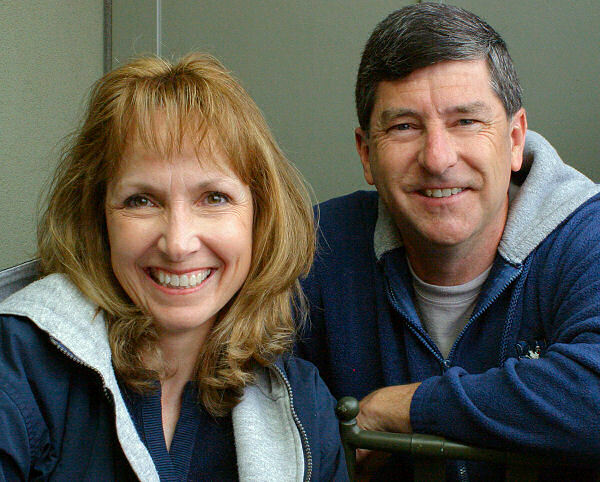 My wife and I celebrated our 25th wedding anniversary on April 4th, 2006. We celebrated by spending a few days at the Disney Resort in Anaheim, California... including 2 nights at Disney's Grand Californian hotel. When we were first planning our trip, I looked around on the Internet hoping to find some good photos and first-hand reviews of the Grand Californian... but didn't find anything very interesting. So, to help anyone else out there who is searching for information on this wonderful hotel, I'd like to offer a few photos and opinions. It's every bit as beautiful in person as this photo makes it appear! Note the piano player in the lower left. This is a really cozy place to sit and enjoy the company of other vacationers. Just on the other side of the wall is another fireplace on an outdoor patio. There are actually three pools, plus several very warm whirlpools. Barely in view in the upper right of the photo is a circular slide which drops in to one of the pools. While the monorail does not actually stop in the hotel itself, the monorail station is just a short walk away. 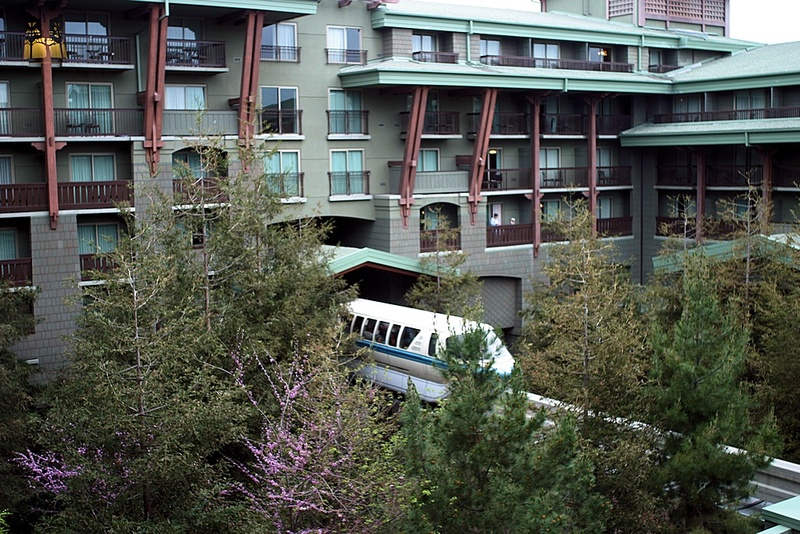 I'm guessing that the whooshing sound of the monorail is probably a little annoying in the rooms near the track. We opted for one of the less expensive rooms, not facing Disney's California Adventure park. We got lucky in that it did overlook Downtown Disney and (in the distance) Disneyland. 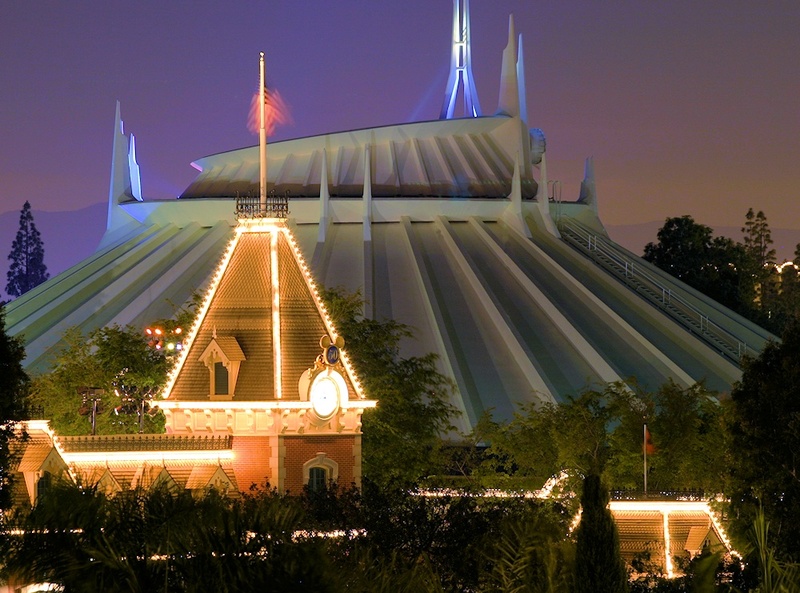 I used a long lens to get this photo of the train station and Space Mountain from the balcony of our room. We really liked overlooking Downtown Disney... and would probably choose that again next time. and we really enjoyed listening to it from the balcony of our room. When we got tired of it, we just shut the sliding door and didn't hear a thing. 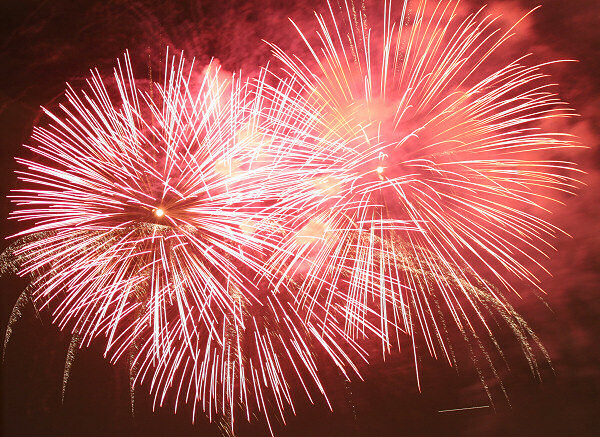 so you've got a view of the fireworks at night. We loved sitting on our balcony and watching the show. I took this shot (with a long lens) from the balcony of our room at the Grand Californian. which was even more enjoyable since we could enjoy the soundtrack, too. I used a tripod and the camera's self-timer to get this photo on the balcony of our hotel room. Location, location, location! 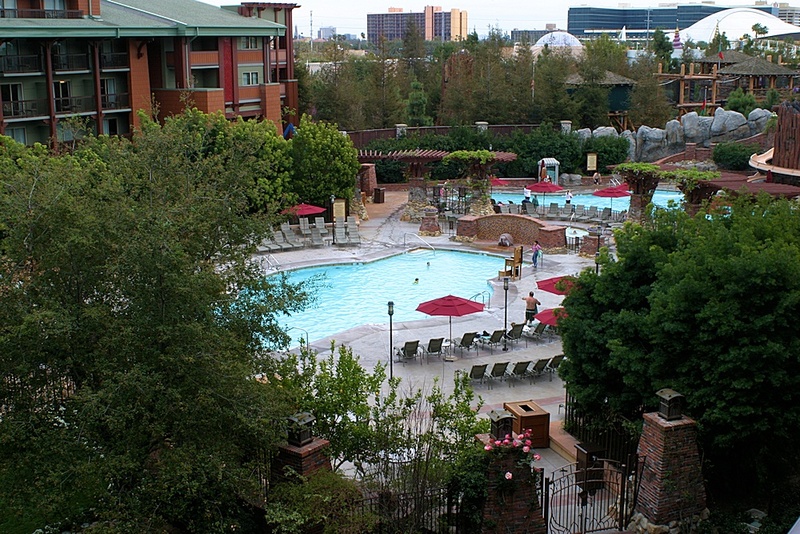 It's right next to Disney's California Adventure, and the Downtown Disney district, and an easy walk to Disneyland. Lots of food and entertainment options are all within an easy walking distance. Easy theme park access! Hotel guests can use a private entrance to California Adventure... which makes it very convenient to go in and out of the park whenever you need to. If you get wet on a water ride, duck back in to the hotel to change your clothes. Feeling tired? Head back to your room for a nap. Hate long lines and large crowds? Be the first in to the park in the morning and ride the most popular rides before things get busy. Head back to the hotel and enjoy the pool in the middle of the day when the park is crowded, and then make your way back in to the park in the evening when a lot of people have left. Great design! Whoever the architect of this hotel was, they really thought things through. Walls are thick and well insulated. The plumbing is quiet. Light switches are backlit so you can find them in the middle of the night. The bathrooms have two sinks so two people can get cleaned up at the same time. The heating and air conditioning system operates on a thermostat... so it's easy to keep the room comfortable. Great service! The employees were friendly, and responded quickly when we needed things. Casual elegance! While it's an elegant, expensive, and tasteful hotel... they know you're staying there to visit a theme park. Shorts, t-shirts, blue jeans, and kids are the norm... and nobody expects you to act like you're used to living in luxury. I'm a very casual person and just hate the atmosphere of a snooty restaurant or hotel where it feels like you're being judged by the staff and the other patrons. 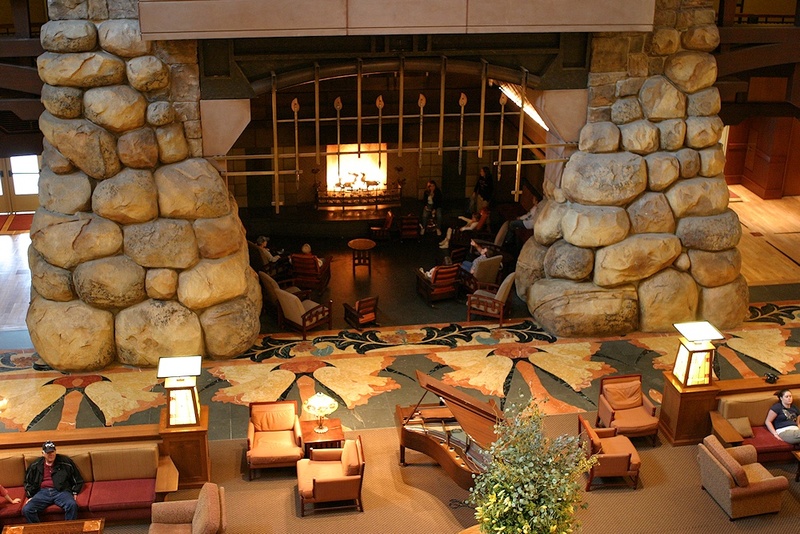 I felt completely comfortable at the Grand Californian, and would definitely stay there again. Bring the kids, or don't! At a place like Disneyland, it's obviously OK to bring the kids and feel right at home. For our 25th wedding anniversary, however, it was just the two of us... and frankly, we didn't really want to listen to a bunch of screaming children. Now maybe this was just plain lucky, or maybe Disney arranges it this way... but it seems like there weren't any kids in the rooms near ours. Walking down the hallways, we passed several rooms where we could hear screaming kids... but when we got down to our corner of the hotel, there was total silence. I have a hunch that Disney puts their childless guests together in certain areas of the hotel... and I sure did appreciate it! Predictable costs! When we went on a cruise ship vacation a few years ago, one of the things that I found really offensive was the way they were constantly trying to get more money out of us. It seemed like the cruise line executives spent more time sitting around thinking of new ways to get us to give them more money than they did thinking about ways to exceed our expectations. 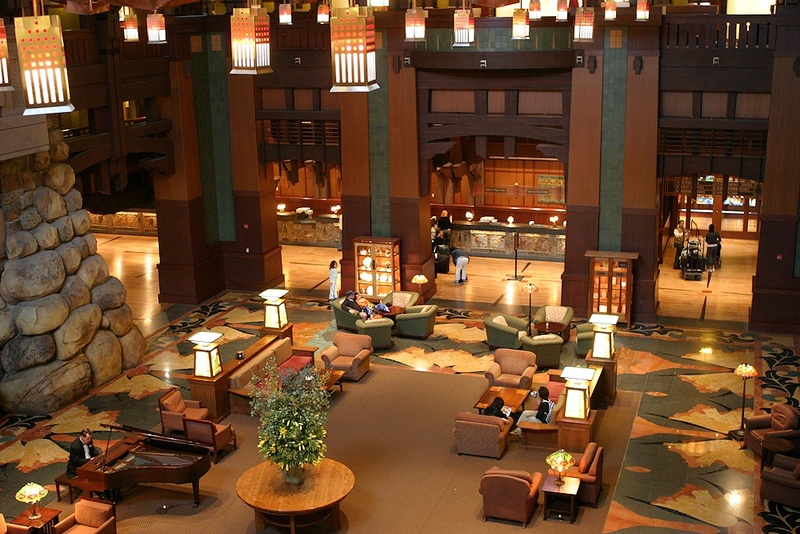 At the Grand Californian hotel, we never felt like they were trying to run up our bill. Sure, there were things that would have cost extra if we had asked for them... like room service, or items in the mini-bar... but nobody was pushing us to use them. On a cruise ship, it just seemed like one sales pitch after another. A classic example is Internet access. Try getting that for free on a cruise ship. It really surprised me that Disney threw that in for no extra charge. I couldn't figure out how to turn on the fan in the bathroom. I'm sure if I had just asked an employee, they could have shown me. Maybe there was a hidden switch somewhere... but I just never found it. Our room must have been a long way from the hot water heater! At home, we have to run the hot water for about thirty seconds before the water that comes out is actually hot. At the Grand Californian, it really took more like four minutes to get any hot water the first thing in the morning. (We're early risers, and must have showered before any of our neighbors did.) Once we let the water run and turn warm, it was fine... and later in the day we didn't have to wait as long, either. The parking lot for self-parking is a long way from the hotel. You can't just park your car outside your room and lug your own bags in yourself. If you need to get something from your car, it's a long walk. When you first arrive at the hotel, unload EVERYTHING you might possibly need and have a bellman take it to your room. Tip the bellman appropriately. Consider valet parking, too. It's a HUGE hotel. Our room was in the farthest corner from the lobby, and it was a LONG walk! If you have any kind of physical disability that makes walking long distances difficult, be sure to request a room close to the lobby. Our original plan for our Anaheim vacation at the Disney Resort was to spend three days and two nights at the Grand Californian hotel. The day before our scheduled visit, we were getting bored at home and decided to get an early start to our vacation. So, we made a last-minute reservation at Motel 6 for the night prior to our two nights at the Grand Californian. Spending one night at Motel 6 and then two in Disney's Grand Californian was such an amazing contrast that it was actually funny! At Motel 6, the bed wasn't very comfortable. At DGC, the bed was more comfortable than the one at our own house. Motel 6 was conveniently located next to a Jack In The Box restaurant. 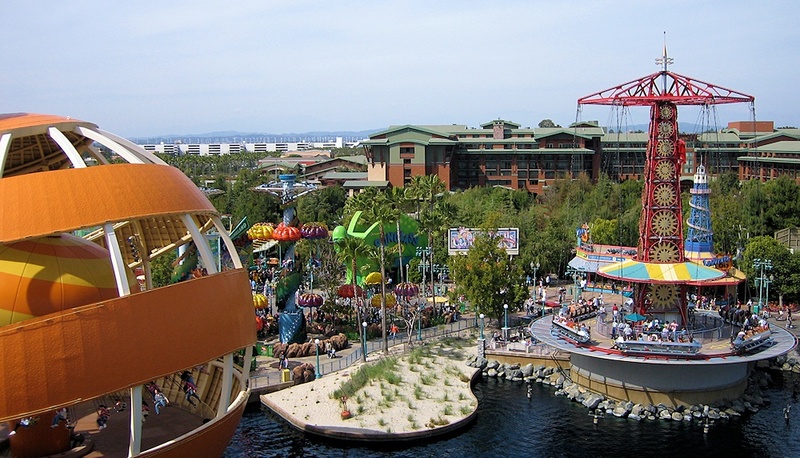 DGC was conveniently located next to Disneyland and Disney's California Adventure theme parks, with a private entrance in to the park that allowed us to avoid the crowds at the main park gate. At Motel 6, even with our door and windows closed, we could hear the freeway outside. At DGC, we enjoyed sitting on our balcony and listening to the musicians playing in the "Downtown Disney" district. If we closed the sliding door, though, there was complete silence. At Motel 6, the people in the next room had a yappy little dog that literally barked almost continuously from 7 PM to Midnight, and at least several times each hour after that. At DGC, we never ever heard a sound through the walls, not even a toilet or a shower in the rooms next to us. At Motel 6, I had trouble figuring out how to turn the lights on when I woke up for a late night potty break. At DGC, the light switches were lit themselves, so you could find them in the dark. At Motel 6, a heating and air conditioning unit under a window had a choice of high or low... and made so much noise you could barely hear the TV. At DGC, a central heating and air conditioning system with (what will they think of next?) a thermostat was so quiet we never heard it running, not even at night. At Motel 6, we each had a pillow and a towel. At DGC, we had 8 pillows, about a dozen towels, and bathrobes, too. At Motel 6, we got about three hours of sleep overnight... thanks to that yappy dog next door and the police stopping by a neighboring room at 2:30 AM. At DGC, we slept like babies. At Motel 6. we used our cell phone to check in with our son back at home. At DGC, we used free high-speed Internet access to check in with our online friends. At Motel 6, they were completely sold out of the Los Angeles Times when I tried to buy a newspaper in the morning. At DGC, there was a copy of USA Today waiting outside our door when we woke up in the morning. At Motel 6, the shower head was high enough to spray water on my stomach... or my head if I got down on my knees. At DGC, the shower was nicer than what I get at home. At Motel 6, a large red stain on the carpet near the bed looked suspiciously like blood. At DGC, there was a red stain near the bathroom sink... but I think it was fruit juice. At Motel 6, the bill for one night's stay was under $60. OK, yes, DGC wasn't cheap... but it was worth every penny!!! If you ever get the chance to stay there, you definitely should! Copyright ©2006 Jim Zimmerlin, Grover Beach, California. All rights reserved.